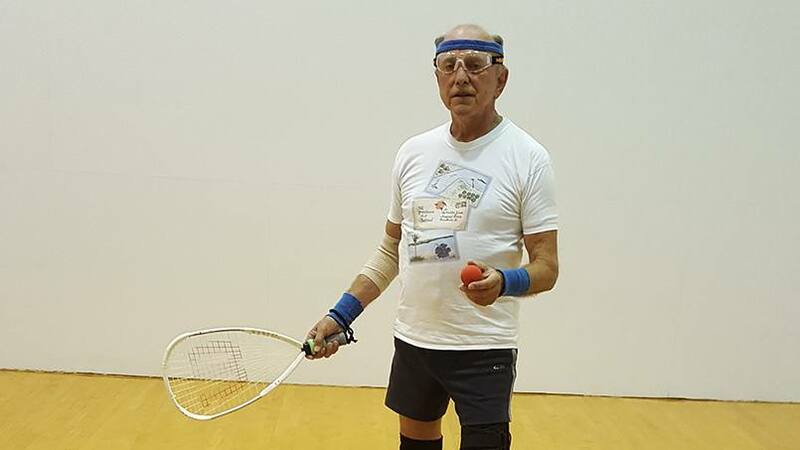 When he began to have serious shoulder pain, James Biond feared his decades-long enjoyment of racquetball might come to an end. But his Mayo Clinic surgeon put those fears to rest. Now after shoulder replacement, James has returned to his favorite sport pain-free. Despite five knee operations and chronic arthritis, James Biond has always enjoyed being physically active. For 40 years, the Jacksonville, Florida, resident has played racquetball several times a week. The former NATO engineer also makes jewelry, and he loves to cook. But in September 2016, James began having pain in his right shoulder. A local orthopedist told him he needed shoulder replacement surgery. He was also told that, after the surgery, he would have to stop playing the sport he loved so much. James wasn't ready to accept that verdict. "I've been playing racquetball for more than half my life, so to give that up would have been traumatic," he says. A search for a second opinion brought James to Mayo Clinic. There, he found a surgeon who was committed to helping him maintain his active ways. In January 2017, James met with Cedric Ortiguera, M.D., in Orthopedic Surgery at Mayo Clinic's Florida campus. "Dr. Ortiguera is congenial, attentive, professional, knowledgeable and empathetic," James says. "He discussed the benefits of the complete replacement." "After having a lengthy discussion with him, I realized how important playing racquetball was for his quality of life," Dr. Ortiguera says. After talking with Dr. Ortiguera, reviewing his options and realizing that his racquetball days may not be over after all, James opted to have total shoulder replacement surgery in February. "From the very first moment I woke up, I was pain-free," James says. After being in the hospital for just a day, James began a physical therapy program at home twice a week, along with daily exercises for six weeks. Five months after the surgery, James played racquetball with his new shoulder. "It was almost like old times. My forehand stroke was less powerful than it used to be, but I had no pain during or after playing the three games," James says. "My goal all along was to be able to get back on the court on a regular basis. This was the first major step toward achieving it." James is excited that he can also enjoy his other passion — making jewelry — without pain again. "When I'm using my metalsmith tools, I need to apply pressure, which feeds back to my shoulder," James says. "I can do that without discomfort now." James says he's back in the kitchen more often, too, now that lifting pots and pans is so much easier. "This hospital experience with Mayo is the most positive I've ever had. Everyone was very friendly," James says. "Everything went like clockwork. I can't imagine having my surgery anywhere else." Read more about shoulder replacement.